This is a basic recipe from which to start experimenting with herbs and spices. 1. In a bowl, soak the oats in the stock for a few minutes. Blitz the beef, pork and salt in a food processor until combined. 2. Stir the egg, onion, spices and 1½ tbsp flour into the oats, add to the food processor, then briefly whizz into the meat. Rest in the fridge for 20-25 minutes. 3. Fry a little of the mixture to check the seasoning; adjust accordingly. 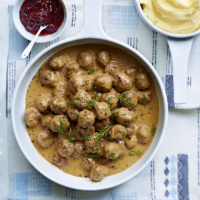 Using damp hands, shape the mixture into 30 meatballs, roughly 2.5cm in diameter. 4. Preheat the oven to 140˚C, gas mark 1. Melt the butter and oil in a frying pan. Fry the meatballs in batches, for 10 minutes each, ensuring there's room for them to move around in the pan. Keep them warm in the oven while you cook the rest. 5. Once all the meatballs are in the oven, make the gravy. There should be at least 1 tbsp fat left in the pan; if not, add a knob of butter and heat until foaming. Whisk the remaining 1 tbsp flour into the fat, then add a splash of water and whisk again as you bring to the boil. Whisk in more water until you have a thick gravy, then add a splash of cream and Worcestershiresauce; season. Stir in the meatballs, garnish with dill, if liked, and serve with mashed potato and cranberry sauce, if liked.